Here marks the male heir's that have longed served Seether Carnage, and are now guiding us from above. Vincent, The mighty king of Carnage. Died due to a bone fracture, following with old age. Vincent was the 1st Red Lord of Seether carnage. His soul can be found in a ink-black fox with solid green eyes. Zarren, God of war and trust. Died of old age, following with a major disease. Zarren was one of the many independent Red Lords, serving all that followed behind him, his mentor was the mighty king of Carnage. His soul can be found as a Gold Eagle with bright golden eyes. Trenton God of Work and Punishment. Trenton served as a beta, for many years with Vincent. His age took the best of him. His soul can be found as a ghostly, russet bull with amber orbs. Died of old age, and other reasons. 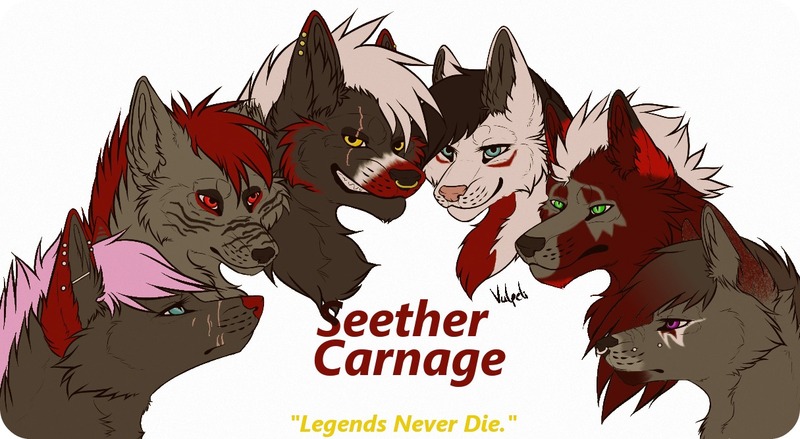 Xarox was Red Lord, until certain events caused him grief, he eventually left Seether, but remained a friend. His soul can be found as a ?? Reigned as a great Lord for his time. Carnival was Red Lord until taken astray by anger, and soon left for quite a while until returning. His soul will be found as a ?? Died of disease passed on by his Uncle. Zaerlyx served as temporary Red Lord in place of his mate, Mercee. She never returned, and soon became permanent Lord for his time. His soul is found as a Bald Eagle.